Black_6_x_9_Envelopes is rated 5.0 out of 5 by 1. "And the black keys never looked so beautiful, and a perfect rainbow never seemed so dull." Sometimes you’ll find that things are better in black (and white). And sometimes envelopes don’t need to pop out at you to make a statement. 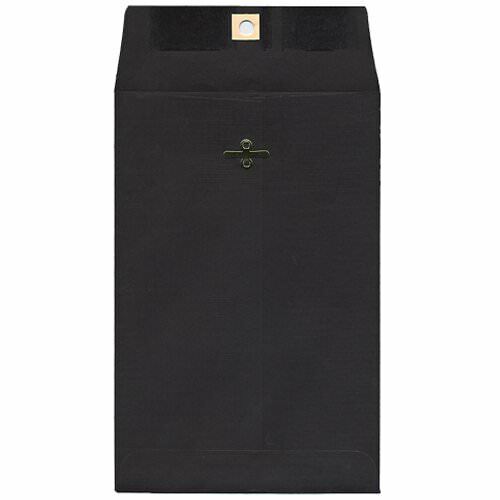 Professional yet stylish, a black envelope like this one could be great for the office. Sometimes color, such as those consisting of the rainbow, will distract a customer or client that walks into the office. Your business will seem dull compared to the loud envelopes you have. So why not black? It is just as beautiful, if not more. These envelopes will keep your business, office and/or you seem simple yet sophisticated. When it comes to succeeding, these may just be the two answers you need (along with this black envelope, if we didn’t make that clear). Black 6x9 Envelopes are available with a Smooth Black finish. Available with Clasp or without. Black Stiff 6x9 Photo mailer is also available. All the envelopes open on small side.